The first KT Munson story I read was Zendar, A Tale of Blood and Sand, which I loved, so when she gave me the opportunity to read another of her work, I graciously accepted. This time, it was a Young Adult fantasy, Unfathomable Chance. It opens with a young Diana exploring a church in England with her mother and twin brothers. The child somehow gets swept into a world not of her own. When she reenters the real world, Diana is confounded by what happened to her, but as she and her family leaves, she begins to forget. On Diana’s 23rd birthday, she realizes that a bracelet had clasped to her wrist, and soon she finds out that it contains the heart of the Cosmos. As she meets unusual aliens, befriends a talking cat and searches for a way to get rid of the bracelet, Diana tries to figure out why the Cosmo chose her. Unfathomable Chance takes off from the moment it opens and holds my attention throughout. After meeting the talking cat, whose name was Kal Zed, I knew that he’d be my favorite character in the story. But that isn’t to say I don’t enjoy the rest I met along the way. Each person and alien in the story held their own. The dialogue was amusing, the chase was fun, and most of the scenes were painted quite well. My only wish for this story would be more talk about the scenery so I could step further into the story like I did with Zendar: A Tale of Blood and Sand. Unfathomable Chance has it all: mystery, romance, comedy. Although I do enjoy Zendar a little more, I enjoyed reading every bit of this story. 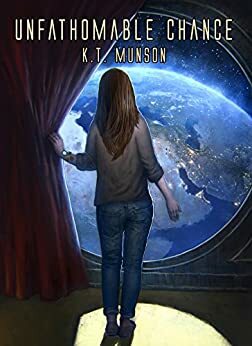 As always, I look forward to reading more books by KT Munson.